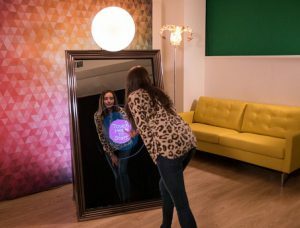 The latest in Photo Booths looks like a mirror; people look at themselves and are actually facing a camera that can print photos on site. Kerry can organise a Mirror Booth for your next event. $800 if you book Kerry for makeup which gives you 3 hours with extra hours available at $100 p/h. View the Mirror Booth video. If you would like to book the Mirror Booth, or a Closed Photo Booth or the new Photo Pod, complete the booking form below. Please note bookings are made with Mirror Booth Australia who organise all our Photo Booths.